Concerned about protecting the security of your WordPress website? You should be! Thousands of websites are hacked every day, and because WordPress is used by about 30% of the web it’s a favorite target for hackers. Perhaps the most dramatic illustration of this was the 2017 vulnerability that led to over 1.5 million websites being hacked, but less dramatic (but no less harmful) hacks occur constantly. That’s not to say that WordPress can’t be a secure, reliable platform for your website to run on. It definitely can, if proper security measures are taken. As this study shows, though, far too many site owners are not taking even the most basic security steps. One of the simplest ways to avoid becoming a victim of hacking is installing the latest updates for WordPress, plugins, and themes. These updates often contain patches for security vulnerabilities found by hackers or researchers. (One popular vulnerability database lists over 11,000 known vulnerabilities that have been found in older versions of WordPress and its themes and plugins.) The quicker you install the updates, the more likely you’ll protect your site before a hacker gets around to targeting you. Since our first analysis was run just 2 days after the new version came out, we reran the analysis on April 13th, 10 days after the release of version 4.9.5. We only found a small improvement, with 44% of the top 10,000 sites running an outdated version (down from 49% the previous week). Because many hackers run automated crawlers that find and exploit vulnerable websites, 10 days is a very long window of opportunity for hackers to find and damage your website. 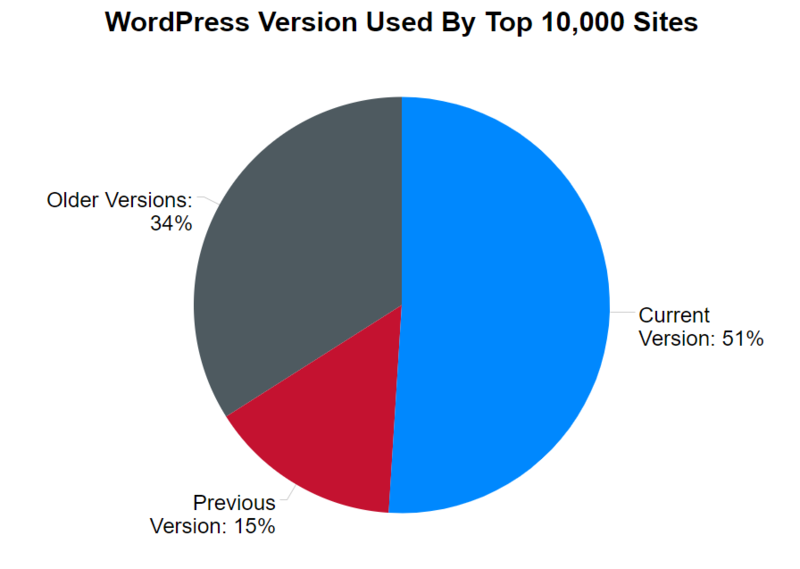 This data shows that low traffic websites are 27% more likely to use an outdated version of WordPress. This seems to make sense, because lower traffic websites typically represent individuals and small organizations that may not have full time technical staff or developers to keep their website updated and secured. Over the past few years, HTTPS has moved from something mostly used by ecommerce and financial websites to a best practice for all websites. In July 2018 Google plans to begin explicitly marking all http sites as “Not Secure” which will further motivate websites to switch to HTTPS. During our analysis, we checked the WordPress sites to determine whether they have setup HTTPS as their default protocol. 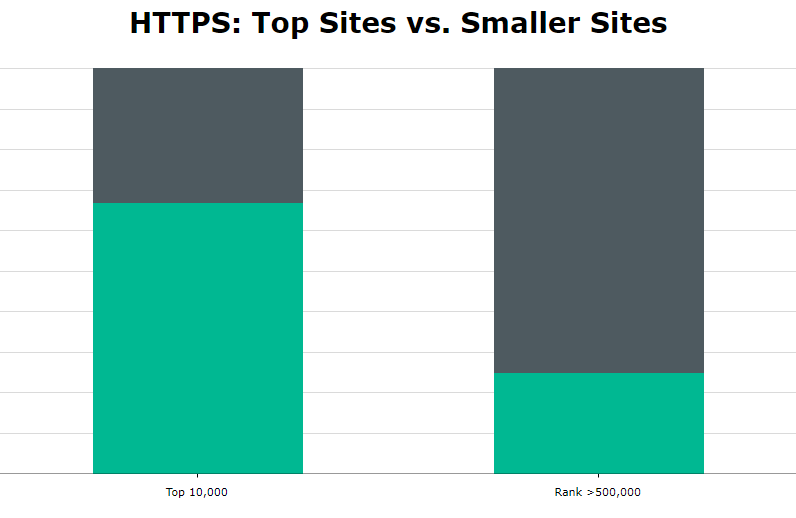 We found that 67% of top WordPress sites have implemented HTTPS as default, while only 25% of low-trafficked sites have.